St. Louis Local 1 member Tim Green offers a presentation about the ill effects of right-to-work legislation at Kansas City Local 124’s hall. That could be the case if anti-worker lawmakers in Missouri get their way by passing a highly-contentious right-to-work bill this year. In the first few days of the 2014 legislative session, GOP representatives proposed making Missouri the 25th state to have the law on the books. But St. Louis Local 1 members are ginning up to stop the bill in its tracks, just as a new analysis finds that right-to-work states score low in overall quality of life. “We’re already mobilizing our members,” said John Moyle, press secretary for the 5,700-member flagship IBEW local. “Education is the first step – making sure that our brothers and sisters have all they need to know about the bill. That way, when people ask questions, they can answer honestly and illustrate the economic impact this could have on our state. “Our members are always our best resource,” he said. Right-to-work laws allow workers to opt out of paying union dues while still benefitting from collective bargaining agreements – a practice that weakens unions' negotiating power. Such laws are enforced in nearly half the states, mostly in the South or in the western part of the U.S., where workers have a diminished voice on the job and face more dangers at their work sites. Indiana and Michigan became the latest right-to-work states in 2012, following coordinated anti-worker efforts by Republican lawmakers, the Chamber of Commerce and the American Legislative Exchange Council – a corporate lobbying group that writes model legislation to promote big-business interests in statehouses across the nation. Supporters of the law argue that employees should not be obligated to pay dues. Labor leaders and progressive economists say this creates a “free rider” problem. Workers benefit from the protection of a collective bargaining agreement without contributing to the union responsible for negotiating their contracts, which include higher wages than most nonunion employers offer. With Missouri in the crosshairs, Local 1 has also reached out to the broader labor community. Moyle penned an article slated to appear in the next issue of the Labor Tribune, a regional publication with wide circulation among activists in the state. “IBEW Local 1 wants Missouri’s working families to know that right-to-work has nothing to do with guaranteeing anyone a job. In fact, it’s likely to cost good jobs,” he writes. A popular meme shared on sites like Facebook and Twitter calls out the American Legislative Exchange Council for its anti-worker policies. 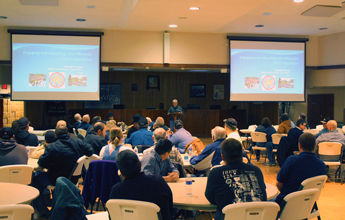 Local 1 member Tim Green, a former state representative, has been giving a presentation on the negative effects of right-to-work several times a week at the local, as well as at Kansas City Local 124 and to other working family groups across the state. Are Right-To-Work States Failing Citizens? “Right-to-work.” It conjures an image of the kind of economic freedom that better allows hardworking families the chance to obtain the American dream. But in states with so-called right-to-work laws on the books, a recent investigation by Politico Magazine paints a bleaker picture when it comes to education, household income, crime and even life expectancy. In a Jan. 24 article titled “The States of Our Union … Are Not All Strong,” reporter Margaret Slattery analyzes data compiled from government research to create a ranking of which states fare better for the overall health of their citizens – and which ones are failing residents. Politico Magazine rounded up 14 different rankings from reputable sources like the Census Bureau, the Centers for Disease Control and Prevention, and the FBI, and on important factors such as high school graduation rates, per capita income, life expectancy and crime rates. Then we averaged out each state’s 14 rankings to come up with a master list. Northeastern states like New Hampshire – which ranked highest – trended toward the top, while Southern states ranked consistently near the bottom. States with better quality of life tend to have a higher union density, while those near the bottom of the list are almost all right-to-work states, where union density is critically lower. “If right-to-work passes in Missouri, this could severely hurt our ability to keep fighting for good-paying jobs in our state,” Moyle said. The outcome suggests the opposite of corporate assertions that “right-to-work” states are doing better than others … Four of the five best states to live in are non-right-to-work. In order, they are New Hampshire, Minnesota, Vermont, Utah and Massachusetts. 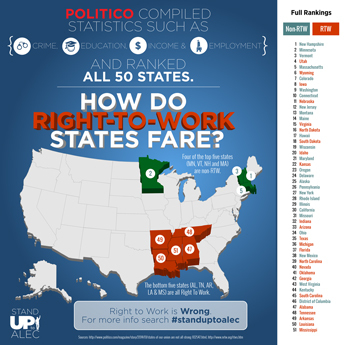 Right-to-work states account for eight of the 10 worst states, and all five of the five worst states (in order, from 46th–50th: Alabama, Tennessee, Arkansas, Louisiana, Mississippi). The majority of right-to-work states are not only in the bottom half of the country, but in the bottom 20 of the 50 states. International President Hill said that the Politico and EPI reports underscore what IBEW members nationwide have always known: it pays to be union. Moyle estimates that the Missouri legislature could vote in spring to put right-to-work on a statewide ballot this year. The GOP majority doesn’t appear to have the numbers to overturn a likely veto from Democratic Gov. Jay Nixon, leaving a referendum vote as an expected approach, Moyle said. In the meantime, Local 1 will keep highlighting the good-paying union jobs that have recently come to the state. Both Ford and GM have invested nearly $2 billion in factory upgrades to their plants in western Missouri, employing IBEW members and helping shore up construction market share in the wake of the Great Recession.